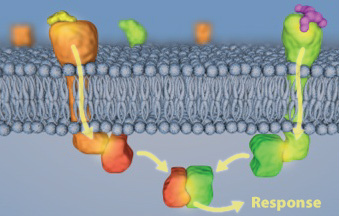 Many signals are transmitted into a cell by first binding to a receptor protein. Here a signal (yellow) activates a receptor (orange) by causing it to change shape, thereby passing information into the cell. Once inside the cell, the signal continues on its way. Its ultimate destination depends on the nature of the signal, with some signals traveling to the nucleus or to other structures inside the cell. Signals most often move through the cell by passing from protein to protein, each protein modifying the next in some way. Collectively, the proteins that relay a signal to its destination make up a signaling pathway. A signaling pathway can have few or many steps. Some signaling pathways branch out in different directions, sending signals to more than one place in the cell. 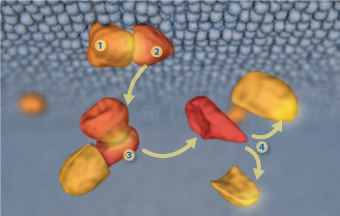 As a signal is transferred from protein to protein, it can also be amplified. By dividing and amplifying a signal, the cell can convert a small signal into a large response. Asignaling pathway: the message is transferred from the receptor (1) to other proteins inside the cell. The proteins work together like runners in a relay race to carry the signal to its destination or destinations. Once a signal reaches its target molecule (usually a protein), it works to change the behavior of the cell. Depending on the signaling molecules involved, the cell can respond in a variety of ways. Each cell receives a complex combination of signals which simultaneously trigger many different signaling pathways. Each step in a signaling pathway provides an opportunity for cross-talk between different signals. Through cross-talk, the cell integrates information from many different signaling pathways to initiate an appropriate response. Combinations of signals are important. Here, a cell responds only when both the yellow and the purple signals are present. Genetic Science Learning Center. "The Inside Story of Cell Communication." Learn.Genetics. September 2, 2010. Accessed April 18, 2019. https://learn.genetics.utah.edu/content/cells/insidestory/.